Till now all of us went to doctor only when we had a cavity or we had a toothache that would not go away. But dentists always recommend that oral care started at a very young age, rather it should begin soon after the baby’s birth. 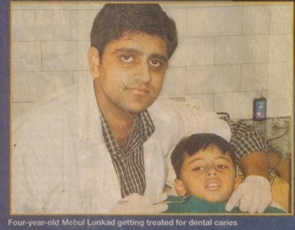 Pune based dental surgeons Dr. Aakash Shah believe that good dental health is established early n life. “Oral care should begin soon after the baby’s birth. Gums should be cleaned after each feeding. You can begin brushing your child’s teeth as soon as they appear, using a soft brush.” Dr. Aakash Shah runs the oracare dental care centre on East Street, Camp. He warned that babies should not fall asleep without washing their mouth as the sugar in the milk or juices can cause cavities, decay, and dental discomfort and even tooth loss.